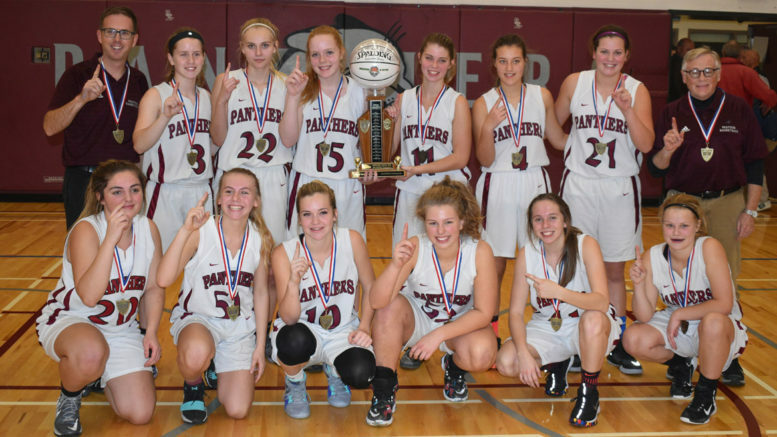 It wasn’t the experience the PECI Senior Basketball Panthers were hoping for last week in London as they dropped three games in succession at the OFSAA AA championship. Still, coach Rob Garden believes the high-level games were a valuable learning piece for a team that potentially can return most three-quarters of its playing roster for the 2019 season. “The sliver lining might be that we’re only losing three players and the other nine now have some OFSAA experience, plus our junior team graduates a strong group of players that will help us next year,” he said. At noon, Thursday, the Panthers opened against a Dundas Valley Gryphons team that lived up to its second seed by winning the silver medals. The Hamilton-area Gryphons were tall and athletic and they brought a relentless pressures defence that turned the tables on a Panthers team known for taking that style of play to its foes. The Gryphons easily opened the tournament with a 57-16 tally. “We struggled to adjust to their speed and found ourselves down 33-7 at half. It was a very good eye opener for our girls to what the next level of basketball looks like, so we focused on some small goals of moving the basketball with a purpose and attacking on offence,” Garden said. Though the game wasn’t in question late, the Panthers did find more confidence as the second half wore on, scoring 10 points to the Gryphons’ 20 in the second stanza. A bright spot was the play of Grade 9 guard Vanessa Wilton, who led PECI with six points. Jessie Swackhammer had four, while Emma Lamorre and Becca McHugh both hit threes. The tournament draw did no favours for the Panthers as Friday morning, they were back on the court against the eventual fourth-place finishers, London’s Mother Teresa Spartans — a team PECI had seen in Windsor during its first foray onto the OFSAA court two years ago. Once again, the Panthers got off to a slow start. Garden said they played a timid game early, falling behind by 23 points by the break. During their halftime chat, the Panthers refocused their effort and played better. They nearly kept pace, allowing the Spartans 22 points to their 16 for a 61-31 final. “During the break, we stressed the message to the girls that they may only get one crack at OFSAA and to leave it on the court in the second half. Once again, we focused on a few key ares of once again moving the back with a purpose and shooting with confidence. Similar to the first game, we had a much better second half,” he said. The Panthers hit five three-point shots during the game. Mikayla Leavitt had 10 points. Emily Wight had six — all from behind the arc, and Lamorre four. Garden credited Sydney Davies for her two-way effort that morning. Friday afternoon, the Panthers faced a must-win contest to stay alive on the consolation side of the tournament and it went down to the wire. The host John Paul II Jaguars got a buzzer-beating layup to satisfy their fans with a 45-44 triumph. Again, it was not the Panthers’ usual start as Garden said players didn’t seem to want the ball and their offensive output went “completely dry.” As it had earlier in the year, the Panthers’ defensive effort kept them in the game and they led by a point in a low-scoring half that saw the teams combine for just 25 points. The Jaguars were the hotter team out of the gate in the third, scoring eight points, but the game wasn’t over. “Our mental toughness has been tested all year and we bent, but we didn’t break, battling back to tie it with 30 seconds left to go,” Garden said. The comeback effort was led by Leavitt and Swackhammer, who had 18 of the 30 second half points. Wight also hit a timely free-throw to even the score with 10 seconds left. After her basket, the Panthers thought they created enough chaos off the Jaguars’ inbound to get the ball back, but the referee awarded it to the home side. Before the Panthers were set, the end-to-end scoring play that decided the game was in motion. “It was a heartbreaking way to lose,” Garden said. Reflecting on the season just finished, the coach is pleased with the results.